Hey Australia! Yeah, I'm talking to you! Your dollar is king at the moment. It's better than no other currency in the world right now. This means one thing - travel is cheap. Head to the USA and you'll get the most bang for your buck. For every Aussie dollar you'll get US$1.05. You'll be blown away at how inexpensive travel in the US is compared to Australia. A main meal in a nice restaurant that would cost you $30-40 back home will only set you back $15-20 in the US. Shopping, particularly for clothes and electronics, is unbelievable. Not only will you get the latest products but you'll get designer labels like Calvin Klein and Ralph Lauren for less than it would cost to shop at Target back home. So, where should you go in America with all those Aussie dollars burning a hole in your pocket? Melbourne to New York flights are currently just over $1300 which is an absolute bargain. You can see a show in Times Square, grab a slice of pizza, walk across the Brooklyn Bridge and see the Statue of Liberty. There's no denying that New York is one of the best tourist destinations in the world. Even if you did want to go all the way to the East Coast, you needn't. You can take a bite out of the Big Apple in Sin City by visiting New York, New York Hotel and Casino. New York New York has some of the best room rates on The Strip. You certainly won't get a decent hotel room in Manhattan for $50 a night! In Las Vegas, that can absolutely be done. New York New York is a four star hotel with large, comfortable rooms. New York New York is one of the older but still in good condition. The actual hotel is smaller than many others on The Strip but the gaming area is huge. If you like to gamble, and chances are you do if you're thinking about travelling to Las Vegas, you won't be disappointed at New York New York. In addition to poker, craps, black jack and roulette, there are tonnes of slot machines to play. If sports and horse racing are you thing, you'll love the big screens and sports book in New York New York. Travelling with kids? Or perhaps you're an adrenaline junkie? Ride the roller coaster at New York New York. Travelling at 67 mph and taking you to over 200 feet is bound to give you a rush! If you're travelling in Spring or Summer you'll need a dip to cool off and the New York New York pool has just been upgraded. Finish off your day with typical New York deli fare, drinks in Times Square and grab a ticket to Cirque du Soliel or the Blue Man Group. 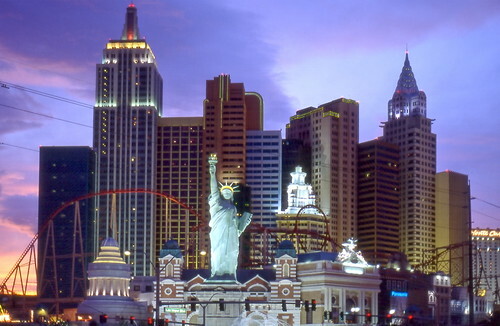 Bring an empty suitcase, plenty of money and experience life in the Big Apple with the fun and excitement of Las Vegas.